PRINCE2 (PRojects IN Controlled Environments) is a structured method for effective project management. The method was first established in 1989 by CCTA (the Central Computer and Telecommunications Agency, now the responsibility of the Cabinet Office – in the UK, revised in consultation with users and project management experts and launched in 1996 as PRINCE2. PRINCE2 is now regulated so that service providers, user organisations and individuals can be accredited against standards in process and knowledge and regulated through examinations and audits. The huge popularity of PRINCE2 is due to the accreditation process, the ease of use and its flexibility in terms of application. 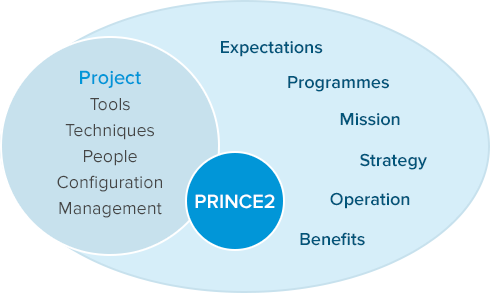 In the current environment, where controlled change and the ability to respond quickly to the market are pre-requisites for survival, PRINCE2 provides the ability to deliver new products and services ON TIME, TO QUALITY and within BUDGET. It does this by focusing on delivery of projects’ outcome and monitoring and controlling the factors that have the ability to adversely impact that outcome. The method can be used at the tactical level within an organisation to provide standards for the delivery of projects designed to achieve strategic, programme or corporate objectives.